Hydrogen-rich electrolyzed warm water (HW) was prepared at 41°C and exhibited dissolved hydrogen (DH) of 1.13 ppm and an oxidation-reduction potential (ORP) of -741 mV in contrast to below 0.01 ppm and +184 mV for regular warm water (RW). Fibroblasts OUMS-36 and keratinocytes HaCaT were used to examine effects of HW against UVA-ray irradiation. Type-I collagen was synthesized 1.85- to 2.03-fold more abundantly by HW application for 3-5 days than RW in OUMS-36 fibroblasts, and localized preferentially around the nuclei as shown by immunostain. HW application significantly prevented cell death and DNA damages such as nuclear condensation and fragmentation in UVA-induced HaCaT keratinocytes as estimated by WST-1 and Hoechst33342 assays. HW significantly suppressed UVA-induced generation of intracellular superoxide anion radicals in both the cell lines according to NBT assay. Wrinkle repression was clinically assessed using a HW-bathing. Six Japanese subjects were enrolled in a trial of HW-bathing (DH, 0.2-0.4 ppm) every day for 3 months. HW-bathing significantly improved wrinkle in four subjects on the back of neck on 90th day as compared to 0 day. 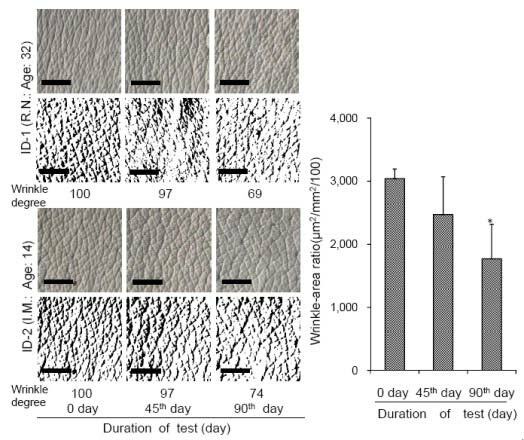 Thus, HW may serve as daily skin care to repress UVA-induced skin damages by ROS-scavenging and promotion of type-I collagen synthesis in dermis. ► Hydrogen-rich electrolyzed warm water (HW) promotes the type-I collagen synthesis in fibroblasts and suppresses cell death in keratinocytes, in accompanying with quenching UVA-derived intracellular reactive oxygen species. ► In addition, a clinical study of HW-bathing demonstrated the repressive-wrinkle formation on 90th day as compared to 0 day. ► Therefore, continuous application of HW reduces oxidative stress in the skin, and expects to prevent the wrinkle formation. Parameters of hydrogen-rich electrolyzed warm water (HW) and regular warm water (RW) measured immediately after preparation and every 30 min up to 180 min of incubation at 37°C. Abbreviations represent Control: Reversed-osmosis ultra-pure water, HW: Hydrogen-rich electrolyzed warm water, RW: Regular warm water.